Does austerity lead to prosperity? PHOTO: Raymond Foltz on Flickr. Quentin Grafton connects the dots on what austerity measures mean for public policy. If the election outcome in Greece demonstrates anything, it’s that while prosperity avoids austerity it is by no means clear that austerity leads to prosperity. Austerity is an extreme form of ‘fiscal consolidation’ where the growth in public spending declines and/or taxes rise at a rate such that government’s budget deficit declines over time, but with the clear intent of reducing wages to improve economic competiveness. It’s distinct from the ‘fiscal consolidation’ underway in the US and UK which is intended to stop unsustainable levels of public debt, not cause deflation. The purpose of austerity is to make an economy more trade competitive and attractive for business investment and improve long-term economic growth. Austerity is what has occurred in Greece since 2010 when its budget deficit was almost 16 per cent of its GDP. The advocates of ‘austerity leads to prosperity’ argue that public spending ‘crowds out’ private spending. Further, if public spending is accompanied by a growing public debt then such spending sends the economy backwards. Austerity advocates believe that reduced public spending can lower real wages. If it does, this can promote economic growth by encouraging higher employment and greater business investment and confidence. 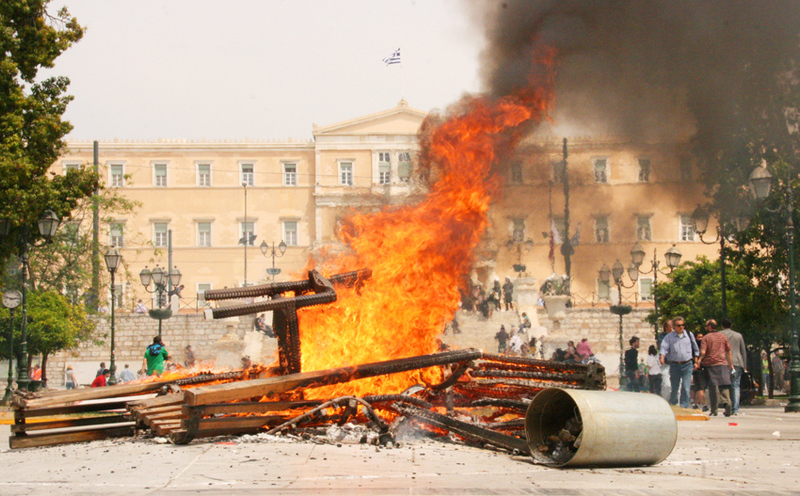 Strike in Athens (May, 2010). PHOTO: George Laoutaris on Flickr. The opponents of austerity use arguments set out by the economist John Maynard Keynes in the 1930s. Keynes argued that recessions can arise from insufficient effective demand for goods and services in an economy that results in unused labour (unemployment) and capital (excess capacity) so that the actual output of the economy is less than its potential. By raising public spending, overall demand can increase to use excess labour and capital and increase economic growth. Thus, where demand is temporarily insufficient to employ all the available labour and capital, more public spending is beneficial to the economy. The message of Keynes, the antithesis of austerity, has been misconstrued by some to suggest that increased public spending is always good. It is as an extreme view as those who believe that reduced public spending is always good. Neither are true. The benefit of public spending depends on what the government choses to spend its money, the overall level of public debt and what point along the business cycle (boom or bust) is this public spending taking place. Unlike some of his followers, Keynes most certainly did not argue for increased public spending at every point along the business cycle. His view was for governments to increase spending in periods of high and demand-deficient-caused unemployment to preserve, in his words, both ‘efficiency and freedom’. This is consistent with the view that over a business cycle government budgets should balance. In other words, governments should be generating surpluses (revenues exceed spending) when the economy is booming and, only in recession, should governments incur deficits (spending exceeds revenues). The standard orthodoxy of economic policy-making, based on Keynes, is to increase public spending during economic downturns or recessions. Indeed, the response of G20 countries to the Global Financial Crisis (aka the Great Recession) in 2008-10 was to increase public spending in a co-ordinated way with the expressed purpose that this spending would raise economic growth and avoid a global economic meltdown. This fiscal expansion worked, as it has many times before in national economies when countries have been in a demand-deficient recession. The challenge for those who want to increase public spending when there is insufficient effective demand is to also balance the government budget over the business cycle. Thus, at some point, there should be cuts to public spending (and/or increases in taxes) when the economy starts to grow again to ensure public debts are sustainable. In a democracy it is, typically, much harder to lower public spending than it is to increase public spending. This is because the losers of lower public spending (typically those who are less well-off), feel the pain immediately while the pain of higher future taxes (typically borne by those who are better off), as a result of increased public spending, is delayed. Consequently, many democratic developed economies have maintained government deficits even when their economies are not in recession. As a result, and over time, they have accumulated large public debts that must be financed out of tax receipts or additional borrowings. So what does this all mean for public policy? First, policymakers have a range of options available to them when responding to recessions, and not just how much they tax and spend. Further, what governments chose to spend their money on can affect the rate of economic growth as some spending supports increased productivity (and greater economic growth in the future) while other spending does not. Governments, and their central banks, can also provide stimulus to the economy, primarily through lower interest rates. Further, allowing the domestic currency to fluctuate can reduce the burden of maintaining or improving trade competitiveness from adjustments in public spending alone. Second, it illustrates the importance of getting the public debt to GDP ratio right. While there is no ‘hard and fast’ ratio to be avoided, with some exceptions almost all countries that have a public debt to GDP ratio in excess of 100 per cent are severely constrained in terms of what additional deficits they can accumulate. This is because investors who buy bonds must be convinced that there will no default or demand a higher rate of interest. Smaller economies and countries that are capital-importing and have consistent trade deficits (such as Australia) are likely to encounter problems of sustainable debt financing at a public debt/GDP ratio much less than 100 per cent. Third, austerity, as has been practised by Greece since 2010 and within a currency area like the euro, can be an economic recipe for a great deal of pain. This is because the entire adjustment of fiscal consolidation must be borne by lower real wages and prices rather than a devaluation of the currency. In the case of Greece, austerity within the single currency zone of the euro, has contributed to a 22 per cent decline in per capita incomes over the past six years. Much of this pain has been borne by the less well off. The pain of austerity swept the anti-austerity party, Syriza, to power this week in Greece. The new Prime Minister, Alexis Tsipras, has vowed to end the previous austerity policies. It remains to be seen whether this new approach can put Greece on a road to prosperity. Mark Blyth’s book Austerity: The History of a Dangerous Idea provides a highly readable perspective on austerity and debt. John Maynard Keynes’ The General Theory of Employment, Interest and Money is still in print and available as an e-book. It is worth reading if, for no other reason, than to make your own judgements/interpretations of what he wrote rather than accept the interpretations of others.